Chrome is not only a browser, but it can serve nicely as an image viewer or a video or music player. Just open a new Chrome tab and drag your picture, music file or video file into Chrome. Chrome will display your image, let you listen to your music file, or play many types of videos. Just about everyone has accidentally closed a browser tab. Did you know there is a quick way to get back a tab or tabs that you didn’t mean to close? There is and it’s really easy to do. 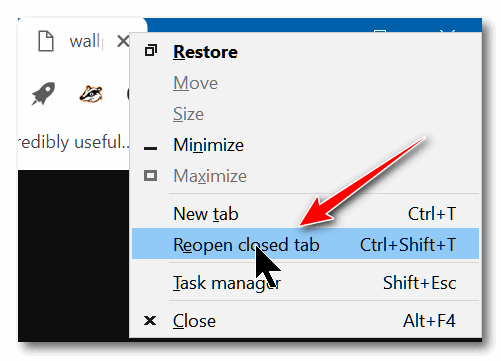 Right-click on any other open tab and select “Reopen closed tab” from the drop-down menu to reopen the most recently closed tab. You can also use the keyboard shortcut CTRL + SHIFT + T. You can keep repeating “Reopen closed tab” or CTRL + SHIFT + T and Chrome will open recently closed tabs working back your way back through your browsing history. Great hints! Now to just remember them!! The first tip you gave was to track a mailed pkg. This is a great feature of Chrome !!! !